"I'm Palestinian and my mother would cook this for special guests. 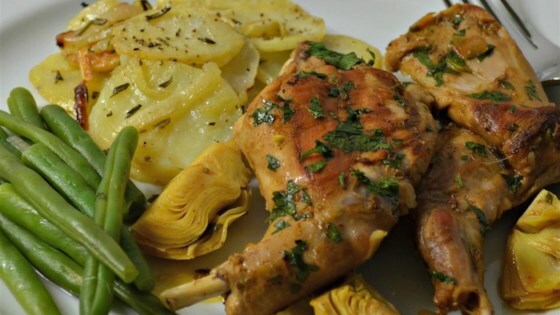 A very exotic twist to cooking rabbit with sage, olives, artichokes and served alongside rosemary potatoes." Toss potatoes and 2 sliced onions with rosemary and olive oil in a large bowl. Season to taste with salt and pepper; spread into a large, shallow baking dish. Bake potatoes in the preheated oven until tender, about 45 minutes. Meanwhile, heat olive oil in a large skillet over high heat. Cook rabbit pieces, turning once, until brown on both sides, about 10 minutes. Add the remaining onion, olives, sage, and marjoram and cook for 2 minutes. Reduce heat to medium-low, cover and simmer for 30 minutes. Stir artichokes, tomato paste and parsley into skillet with rabbit. Replace cover and simmer until artichokes are tender, about 15 minutes. Serve with rosemary potatoes. tasty! I too used bottled spices, came out really nice. I added a dash of lemon which did add a nice tang at the end. Highly recommend this dish if you want something that's not rabbit stew!